The Sunday morning newspapers told the story – or rather, they didn’t. Checking my hometown newspaper and surveying many of the papers that appear on the internet, it was quickly apparent that Saturday night’s rousing IndyCar Series finale made virtually zero impact outside of Homestead-Miami Speedway. It isn’t that many years ago that the idea of open-wheel drivers, vying for a championship in a wheel-to-wheel battle at more than 200 mph would have brought a media room full of writers from around the country and a wave of interest from coast to coast. Sure, NASCAR has long since become the 2,000-pound gorilla of American motorsports, but the IRL and the now-defunct CART series kept enough of their panache to at least prompt real sports fans to want to know who won the latest race and, especially, who won the championship. Take a survey today of the nation’s biggest sports mavens and it seems pretty unlikely that more than a handful of them could tell you that Dario Franchitti overcame the challenge of Target Chip Ganassi Racing teammate Scott Dixon and Team Penske’s Ryan Briscoe to win the finale and, with it, the 2009 title. It’s a compelling story, considering that Franchitti left the IndyCar Series after winning the championship in 2007 to take a run at NASCAR. That effort was cut short by lack of sponsorship money, but Franchitti’s NASCAR boss, Ganassi, knew he had a quality driver who could work well with two-time champion Dixon in the open-wheel series. 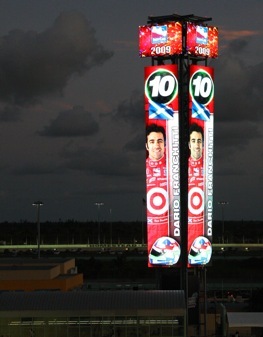 Franchitti picked up right where he left off in IndyCar, winning five times and finishing in the top five 13 times in 17 starts for the Target team. But the entire season was a great battle among the top trio, with Dixon winning five times, Briscoe winning three times and the points lead changing hands 15 times in those 17 events. The technical rules messed up the on-track competition early in the season, making for some fairly boring races. But changes were made and things definitely improved as the season went on. Unfortunately, with IndyCar now being shown on Versus, hardly anybody was watching. Even many of the people who actually had the cable channel available found other things to do or other things to watch. That too is a shame because Versus did a very decent job of covering the series _ much better than ABC/ESPN have in recent years. American open-wheel racing once had a dozen or more names that people other than avid racing fans recognized – Mario Andretti, A.J. Foyt, Rick Mears, Nigel Mansell, Al Unser and Al Unser Jr. among them. All of those except Mansell are Americans, but the home folks haven’t had much to cheer about of late. The last American driver to win an IndyCar race was Ryan Hunter-Reay at Watkins Glen in July, 2008, 25 races ago. The current series has a handful of American drivers, including Danica Patrick, Graham Rahal and Marco Andretti. All have won, but not enough and not lately. And, obviously, the economic crisis has hurt IndyCar as much or more than it has hit NASCAR. To have any chance of national success, the series must have an American driver or two racing for wins. Rahal and Andretti could make a difference if they became regular winners. But it’s Patrick who could be the big difference maker. She has the potential to draw plenty of national and international attention if she can finally become a series contender – a very big if based on past performance. Some new blood, in the form of new teams, could be helpful, and two-time CART champion and former Indianapolis 500 winner Gil de Ferran is trying to put together a deal for what he hopes will be a new two-car team with some potentially exciting drivers. A legitimate series sponsor, a national company that would promote the series and reach potential new fans, would certainly be a plus. With the recent fall from grace of IRL founder Tony George, somebody has to step up, take control and give the IndyCar Series some real, intelligent leadership. Somehow, reaching more people on TV would be a big gain. Without at least a few of those things taking place, and soon, the future of the IndyCar Series isn’t looking very bright. And, worse, hardly anybody seems to care. Tony’s mother and sisters woke up from their slumber about a decade too late to make an difference whatsoever. Tony got played by Big Bill France and Bernie Eccelestone and the damage wrought will take at least a decade to repair, if it ever will be. The fall of American open wheel racing can be traced directly to the formation of the IRL, it’s no coincidence that open wheel has turned into this. The sport I once loved is gone, and I’m afraid it will never come back, sad but NASCAR won the open wheel war! I’m very disapointed that there hasnt been very many (if at all) home grown open wheel talent getting opportunities in Indycar. And here’s a name for you, Bobby Santos III. This guy can drive. The legacy of Anton Hulman “Tony” George lives on.